Therapy Chicago: Make New Friends By Trying New Things! 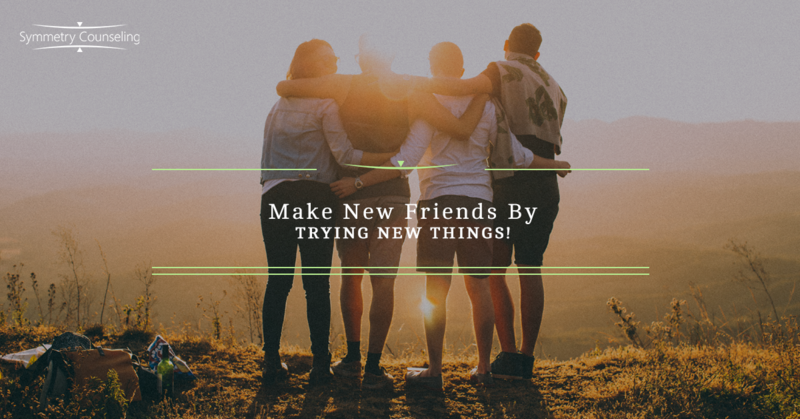 Make New Friends By Trying New Things! As we age, it can become increasingly difficult to meet new people and make new friends. If we are lucky, we hold onto some older friendships, but as real-life circumstances change (work, marriage, parenthood, etc. ), we can find ourselves less engaged with our social circle. The solution to this problem would seem obvious: meet new people! But this is not as easy as it might seem. In my work as a therapist, one common issue I encounter is loneliness and feelings of being socially isolated. I am frequently asked by my clients how and where to meet people. Before I attempt to answer that question, let’s examine what exactly we are choosing to do with our free time. Let’s face it: for many of us, our hobbies and interests involve consumption of entertainment, food, beverage, and material possessions. Many of the things we do for fun fall under the category of being entertained: theater, opera, movies, concerts, professional sports, or enjoying our home entertainment systems. Likewise, many of us enjoy going out to restaurants, nightclubs, bars, and coffee shops, all of which include the consumption of food and beverage. The common theme is that these activities all involve passively consuming products rather than being actively engaged in doing or creating something. The potential for meeting new people increases significantly when we seek out and participate in activities we are interested in, or at least curious about. These may include gardening, sailing, joining a book club, volunteering/mentoring, engaging in religious/political/cultural groups, taking dance lessons, learning to play an instrument, taking a stand-up comedy or improv class, learning to cook in a culinary class, taking a class at a college or university for personal interest, joining a sports league, participating in game nights, or joining a professional or alumni group. This is not meant as a criticism of consumption as a hobby or interest. However, it is important to acknowledge that most of these activities have relatively limited potential for meeting new people, let alone forging new friendships. It’s common to strike up a conversation with strangers at a concert or a baseball game, but do not expect all of these interactions to translate into new relationships. Bear in mind, engaging in any of these above mentioned participatory activities does not provide any guarantee for forming new friendships. However, pretty much all of them require interactions with other people who share our interests. These provide a significantly greater opportunity to actively meet and interact with people when compared to the passive consumption of entertainment, food, and/or beverage. Again, this is not meant to be a knock at being entertained, wined, or dined – all of these are a normal part of a balanced lifestyle. However, meeting new people and forming meaningful relationships has a greater potential for success when we pursue and engage in structured activities. So where to start? I suggest exploring the multitude of options provided by the website/mobile app Meetup, which is designed to bring people together who share mutual interests. A targeted Google search can also uncover social groups and organizations of which we were not previously aware. Always keep an eye out for flyers posted at coffee shops, restaurants, or community bulletins, and keep an ear out for word of mouth opportunities. Meeting new people is not easy, and unlikely to happen by accident or chance. If you are experiencing loneliness or social isolation, I suggest exploring these options, either on your own or with one of our licensed therapists at Symmetry Counseling. Call today to make an appointment.